TOKYO – Kim Jong Un has taken another key step to consolidate his family’s control over North Korea, elevating his younger sister to the powerful political bureau of the ruling Workers’ Party and moving her closer to the center of the leadership. Kim announced that his 30-year-old sister, Kim Yo Jong, had been promoted during a weekend of festivities celebrating the Kim family’s grip on the totalitarian state, and amid expectations of a new salvo of missiles. The North Korean regime will on Tuesday celebrate the 72nd anniversary of the founding of the Workers’ Party, through which the Kim family controls the country. A top Korea analyst at the CIA last week said that the U.S. government should be ready for another North Korean provocation this week – not least because the Oct. 10 anniversary overlaps with Columbus Day in the United States, given the 12-hour, 30-minute time difference between Pyongyang and Washington. This would provide North Korea with the opportunity to both celebrate an important day on its calendar and interfere with an American holiday weekend. “Stand by your phones,” Yong-suk Lee, deputy assistant director of the CIA’s Korea Mission Center, said he’d told his staff. He was speaking at a conference in Washington last week. However, there were expectations that North Korea would do something incendiary last Oct. 10 and the day passed without a bang. President Donald Trump sent his own warning signal Saturday, saying in a tweet that years of diplomatic negotiations and agreements with North Korea had come to nothing and that “only one thing will work.” He did not say what that “one thing” was. North Korea’s nuclear weapons are necessary “for defending the destiny and sovereignty of the country from the protracted nuclear threats of the U.S. imperialists,” Kim, who is chairman of the party among many other titles, told the meeting of the party’s central committee, according to a state media reports published Sunday. A weekend of celebrations included a parade celebrating 20 years since Kim Jong Il, the current leader’s father, was elected general secretary of the Workers’ Party. Kim Jong Un also visited the mausoleum where his father and grandfather, “eternal president” Kim Il Sung, lie in state. 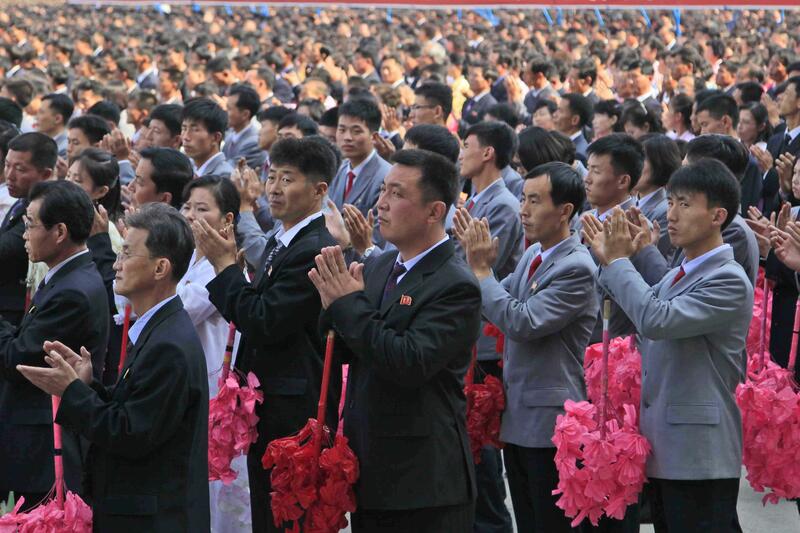 These events would seem like standard behavior in North Korea’s personality cult if it weren’t for the appointment of Kim Yo Jong as an alternate member of the main political branch of the Workers’ Party. The Rodong Sinmun, the party newspaper, showed photos of those who had been promoted at the meeting: eight men in the their 60s or older, and Kim Yo Jong, the only woman and the only person not approaching pensionable age. She is thought to have been born in 1987. She is taking the place of their aunt, Kim Jong Il’s sister Kim Kyung Hui, who has not been seen in public since Kim Jong Un had her husband, Jang Song Thaek, executed in 2013. Intelligence analysts believe she is still alive, but very sick and no longer involved in the leadership. Analysts saw the sister’s elevation as the latest sign that Kim Jong Un is trying to boost her standing in the regime. The Kim family claims its legitimacy through the “Paekdu bloodline” – the idea that their family has been destined, by a sacred Korean mountain, to lead the country. Kim Jong Un, who is 33, has played up the bloodline angle as he has sought to cement his claim to be his father’s rightful successor. But it is is not clear who would succeed Kim Jong Un if he were to die suddenly. He is thought to have two or three children, at least one of whom is a boy, but they are all younger than six years old. Michael Madden, an expert on the Kim family who runs the North Korea Leadership Watch blog, thinks that Kim Jong Un might be positioning his sister as the next heir to the family dynasty. Kim Yo Jong was involved in ensuring the succession process from her father to her brother, and has taken on a series of increasingly prominent roles over the last couple of years. In 2014, she was made deputy director of the Workers’ Party’s Propaganda and Agitation Department – a position that led the Treasury Department to sanction her by name in January for her role in censoring information in North Korea. The role is not just symbolic. She was seen working during a big parade in Pyongyang in April, rushing out from behind pillars to bring paperwork to her brother. She also appeared on stage with him during the opening of a landmark construction project in the capital, Ryomyong Street, where she was dressed in a functional black suit and appeared to be coordinating photographers and other logistics. Lim does not think she is seen as a potential successor in highly Confucian – hierarchical and male-dominated – North Korea. “She can’t be leader. She’s a female,” he said. As with many other figures in North Korea’s opaque leadership, little else is known about Kim Yo Jong. Some South Korean and Japanese newspapers have reported that she’s married to a senior finance official and that they have at least one child. Another report has it that she fell in love with a bodyguard. And another says she’s single and childless. Regardless, she is clearly close to her brother. The two, together with oldest brother Kim Jong Chul, are full blood siblings, the children of Kim Jong Il and his second wife, Ko Yong Hui. They all went to school in Switzerland in the 1990s. Among the other personnel changes this weekend, Foreign Minister Ri Yong Ho – the man who called Trump “mentally deranged” when he visited New York for the U.N. General Assembly last month and threatened to detonate a hydrogen bomb over the Pacific – was promoted from being an alternate to a full member of the politburo. Published: Oct. 8, 2017, 8:46 a.m. Updated: Oct. 8, 2017, 10:04 p.m.